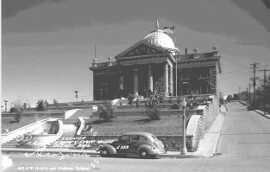 In 1993, Santa Cruz County embarked on a remodel of its 1904 courthouse. Considered the finest courthouse in the country when it was completed, the building was no longer in use as a courthouse by the 1990s. In addition to structural repairs and changes needed to make the building accessible to people with disabilities, the County decided to remodel the courthouse into an Arts and Cultural center so the building could continue to be used by the people of Santa Cruz County (Santa Cruz County Courthouse Historic Structure Report, Feasibility &amp; Design Study Phase. 1983 Ca. Janus Associates, Inc. Cannon &amp; Associates, Inc.. MG 111, SG 5). Use the document analysis sheet and the photograph analysis sheet to uncover clues about the people that created the documents. Where is the Santa Cruz County Courthouse? When was it remodeled? Why was it remodeled? What do the blueprints tell us about the remodel & the original structure? What don't they tell us about the remodel and the original structure? Compare the Santa Cruz County Courthouse with other county courthouses in Arizona. How many have been repurposed? What do you think is the best use for an old courthouse building, and why?